This is an epic read and thoroughly interesting and entertaining in equal measure. As former head of the SAS and as commander of the First Battalion the Royal Irish Regiment he describes dealing with murderous terrorists in Ireland, the West Side Boys in Sierra Lone to the invasion of Iraq with clarity and some humour. A compassionate man by nature he is also fiercely dedicated to achieving the mission he is set. He has a wonderful grasp of the importance of culture, religion and sets incredible examples of peaceful conflict management in some very frightening places where there is little respect for life from some people. 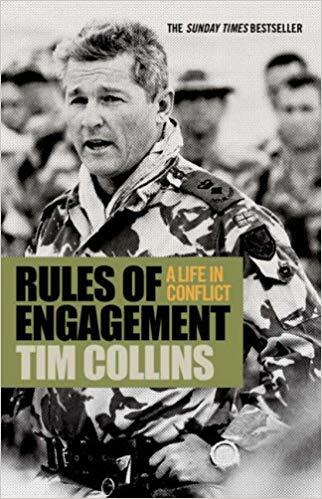 Tim Collins embodies the diplomatic warrior, his skill lies in using soft skills first and foremost but there is an iron hand ready to follow if that does not work. He has proved himself to be an expert negotiator and strategist but honestly discusses the things that went wrong. He clearly commanded the loyalty of his forces as those who lead by example do. This book is a behind the scenes look at how modern war is waged, it is very different than what we see on the news. What struck me was the complexity of the operations and the scale of everything and yet Collins was still able to focus on the individual be it friend or foe. The book itself is epic in scale and gripping, a real page turner. For me this was a great read. Tim Collins made a legendary speech to his troops as they prepared to cross over into Iraq, I do not have the original but here is a recreation by no other than the great Shakespearian actor Kenneth Branagh. Collins is one of that rare breed of men who wears his heart, alongside the Union Jack, on his sleeve. A gentleman and a scholar. Read the book, it is a cracker. This man should be Prime Minister but that is just my opinion.